Representative Honours: Northern Ireland: 12 Full Caps / 6 Goals (1961-1966), 2 Under-23 Caps / 2 Goals (1963-1964), Youth; Irish FA Representative. Club Honours: (with Swansea) Welsh Cup Winner 1965/66; (with Dundalk) League of Ireland Champion 1975/76; FAI Cup Winner 1976/77. 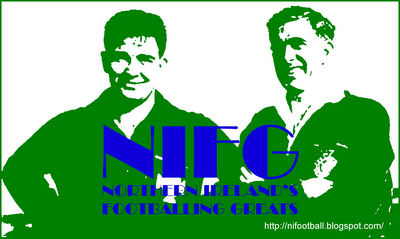 Awards: FAI Special Merit Award 2002; SWAI Personality of the Year 1979, 1984, 1989; SWAI Special Merit Awards 2010. Left-winger Jimmy McLaughlin burst on to the Irish League scene as a sixteen year-old in 1957/58, scoring on his début against Crusaders and top-scoring for Derry City with sixteen goals in his first campaign, marking himself as “star material”. In the summer of 1958 he signed apprentice forms with Birmingham City, netting Derry a “satisfactory” £4,000 fee in the process. It wasn’t until a move to Shrewsbury Town two years later that McLaughlin was given his League debut. His adaptability within the forward line meant he slotted in comfortably at centre-forward and inside-forward, as well as his preferred role on the wing. A return of twenty-plus goals in each of his first two seasons with the Shrews brought McLaughlin to the attentions of Northern Ireland boss, Peter Doherty, who installed him as replacement for another goalscoring outside-left, Peter McParland. 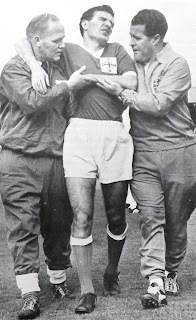 He scored on his international debut against Scotland in October 1961, but no doubt any elation was tempered by the 1-6 defeat. A brace on his second international appearance against Greece was the first of two international ‘doubles’. The second, against England in 1964, was during a remarkable match in which the English romped into a 4-0 half-time lead thanks to a Jimmy Greaves hattrick. In the second-half the Irish rallied, giving England a real fright by taking the scoreline to 4-3, McLaughlin’s two-goal haul all the more impressive due to a severe shoulder injury. In May 1963 Division Two Swansea splashed a club-record £16,000 on McLaughlin’s signature. His first campaign at the Vetch Field was so close to both a dream and a nightmare. In the FA Cup Swansea defeated Stoke and Liverpool on the way to the semi-final, where they met Preston North End at Villa Park. McLaughlin scored and hit the wood-work three times, but Preston won through to Wembley courtesy of a controversial penalty and a freak goal by centre-half Tony Singleton, scored from the half-way line. In the League the Swans finished just a point above relegation to Division Three. McLaughlin’s time with Swansea continued in an up-and-down fashion. In 1965 Swansea succumbed to relegation, but in the following year he won his first senior honour, Chester defeated 2-1 in the Welsh Cup Final. That season he also scored twenty League goals and won his twelfth and final Northern Ireland cap in a 4-1 win over Wales. In addition he was capped as a Youth and twice at Under-23 level, scoring on each of his appearances against Wales. A short stay at Peterborough in 1967 preceded McLaughlin’s return to Shrewsbury. In his first campaign back at Gay Meadow the Shrews just missed out on promotion from Division Three, finishing third. Thereafter the club wallowed in the bottom half of Division Three, without really flirting too closely with relegation. He returned to a cash-strapped Swansea (by then renamed ‘Swansea City’) in November 1972. Managed by ex-international colleague Harry Gregg, McLaughlin was appointed player-coach. His experience could not help save the Swans from relegation to Division Four, and that was where he played his 461st and final League game, in a 3-1 defeat by Doncaster on 3 November 1973. McLaughlin remained at the Vetch Field, also filling the role of club secretary, until his appointment as Dundalk player-manager in November 1974. There began a twenty-five year management career in which he became the most successful boss in League of Ireland history. With Dundalk (twice), Shamrock Rovers, Derry City and Drogheda United he won seven League titles, six FAI Cups, four League Cups and a promotion from Division One, plus Leinster Cups, Presidents Cups and North-West Cups. He also took charge of the League of Ireland representative team and the Irish Olympic side, before retiring in May 1999. England won 4-3 in October 1964. Summary: 12/6. Won 5, Drew 1, Lost 6. Summary: 2/2. Won 0, Drew 1, Lost 1. Jim's League of Ireland management career was staggering. He took a struggling Dundalk to 3 league titles, 3 FAI Cups and regular European football, including an eight-match unbeaten at home in Europe. Then he moved to Shamrock Rovers and led them to the title in his frist season- their first in 20 years. He followed up with back-to-back doubles before leading Derry to promotion and then the treble. He also managed the League of Ireland side with distinction as they played in South America, New Zealand, Middle East and Singapore. I went to Swansea in 1974/75 season and played my first game with Jim and the Great John Charles. Even though I played badly he was full of encouragement . A real gentleman.